SUNNYVALE, Calif. - May 15, 2018 - PRLog -- Conversation.one grabbed the 'Best of Show' award at the FinovateSpring 2018 event in Silicon Valley. Its build-once-deploy anywhere platform for conversational applications allows businesses to build Alexa Skills, Google Home actions, chat and voice bots in a single process, while improving accuracy levels of voice and chat interactions between people and machines by more than 100%. 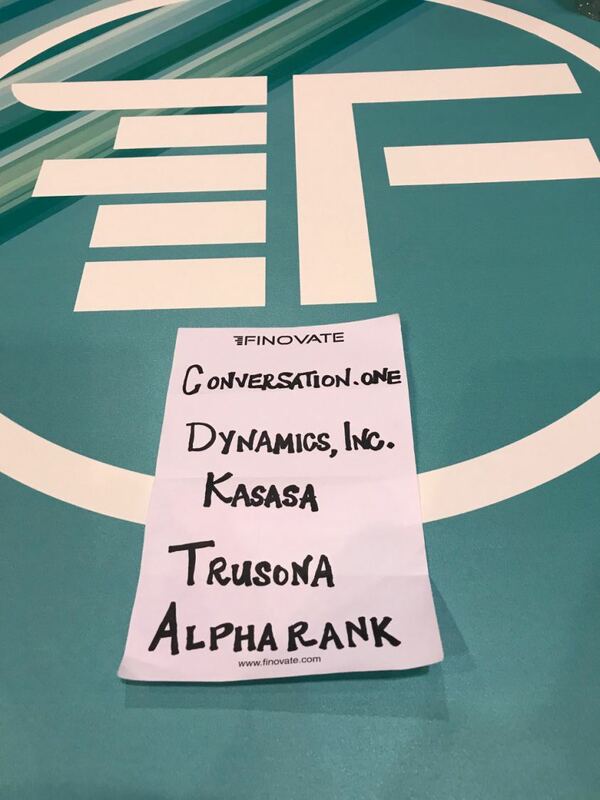 "This is the first time we've participated in Finovate and we're both honored and excited to be voted as 'Best of Show' by the finance industry's leading tech and business executives", says Rachel Batish, co-founder and CRO of Conversation.one. "We're building a disruptive solution to help financial institutions of all sizes serve their clients better and smarter, and we're excited about the vote of confidence we just received from the audience." The audience gave their popular vote to Conversation.one as 'Best of Show' winners after listening to a whopping 30 presentations on innovative products and companies. Their presentation demonstrated how banks and credit unions can build their conversational applications in less than 3 minutes and have them instantly deployed on Amazon Alexa, Chatbot, phone assistance, Google Home and any other device and channel. Conversation.one's banking solution provides pre-built conversational flows that provide customers with access to real time data and insights, including information on their checking account balance, recent transactions, amount spent at a specific store on a particular date, as well as enable them to transfer funds from one account to another. The platform pertains to strict security modules that allow FIs to implement and enforce their individual security standards for different conversational channels, with an SSO module and a 2-factor authentication module. Conversation.one is a build-once-deploy-anywhere platform for conversational applications. From Alexa Skills and chatbots, to Google Home actions and phone and texting intelligent assistants, Conversation.one is a no-coding, no-programming, intuitive, visual and user-friendly platform that allows businesses to easily build, maintain and update their conversational apps. The platform combines deep-learning and crowd-sourcing methodologies to continuously improve conversational accuracy and build rich, fluent and natural correspondence with any device, while maximizing user communication.